Knitting TIp! What knitting needles do I need? Following up on last weeks blog post about where to place markers in knitting, I want to continue to talk about the tools we use and how to use them. Specifically: knitting needles! The options are endless and what much of it comes down to is preference. Do you prefer wood (less slippery) to metal (pointier for lace and fine detail work), straights or circulars? Here's a run down of the different types of needles, their uses and the best way to get started on building your pefect collection. Many knitters start out with two straight needles and a huge skein of worsted weight yarn to knit a scarf. It's a noble goal (see what I did there?) and a fabulous way to learn the ins and outs of knitting and purling. Many straight needles are wood or bamboo and many have the size of needle stamped on the top stopper so it's easy to identify. Check out our selection of straight needles! And while I won't speak ill of any needle, these beautiful needles do have a minor drawback: they are very limiting with regards to the width of project you can create. The length of the needle is generally about the entire width of the project - hence why they're so great for scarves! If you're brand new to knitting, I think a set of straights is a great way to get started. Often referred to as DPNs, double pointed needles are the way we knit many small-circumference projects. It's not the only method, but it's the most common. In fact, DPNs was the way socks were knit before some new techniques (Magic Loop, Two Circulars or 9" circular) were developed in the last decade or two. DPNs are most commonly sold in a set of 5 needles - all the same size and length in a single set. I find I often buy these as I need them rather than purchasing an entire collection all at once since I don't use them very frequently. But if you're going to knit hats or mitts, I definitely recommend investing in some DPNs to make your task easier. Double Pointed needles come in a variety of lengths - I think a safe way to go is a set of 8" needles since you can use it for hats, mitts, etc. While shorter lengths do exist, my 8" lengths are the ones I always reach for since I have lots of room at the end of each needle to a) hold on to as I knit and b) avoid stitches sliding off the tips. Ah... now this category of needles has my heart! I use circular needles for everything! But - "circular needles" is a huge category of tools and can get pretty overwhelming. So, I'm going to break it down by style (fixed circulars vs interchangeables) and discuss some of the popular lengths and their uses. 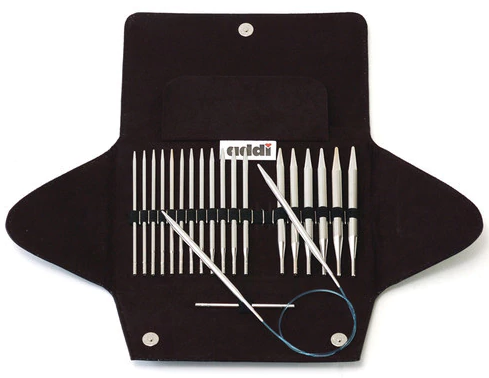 An interchangable needle set is the perfect way to build up your collection of needles quickly without spending too much money. Most interchangable needle sets include a set of needle tips ranging from US size 4 (3.5 mm) up to a US 15 (10 mm) and also include a selection of cable lengths. The needle tips are threaded on one end so you can attach any one of the cables in the kit to create a circular needle in the length that you need. There are now needle kits that come in smaller circumferences than the range noted above for things like socks which is a knitters dream come true! Be forewarned: many interchangable sets do not come with a cable to create a 16" circular needle since the tips are too long. More and more companies are offering shorter-tipped sets so be sure to check which cable lengths are included in the set you're looking to purchase! And this is where the Fixed circulars come into play! Fixed circular needles are typically bought individually and are one fixed length. The length of the needle tip varies with brand as does the quality of the cable. I do find that I want fixed circulars for particular projects (which I've discussed below) and therefore will have duplicates of needle sizes in my fixed circulars and my interchangables. It's a collection I have amassed over time as my preferences for needle styles have evolved. Much like DPNs, I buy fixed circulars on an as-needed basis rather than a huge collection of them all at once. I still defer to my interchangables more often than not. 16" Circular needle: this is the most common circumference for knitting a hat in the round. While you CAN use DPNs, it's much faster to knit the majority of the hat using a 16" circular and saving the DPNs for closing the top of the hat when the circumference becomes too small for the circular needle. This is a great needle to get as a fixed circular. 24" Circular needle: my go-to needle length for cowls. While you can also use this length for the start of shawls, as a circular needle it's the most common for close-to-the-chin cowls or infinity scarves. You can use either a fixed circular or an interchangable in this instance! Two 24" circulars are prefect for working mittens or socks using the 2-Circulars method of knitting in the round. Any longer and you'll just find you're frustrated with overly-long cables. Here's a video tutorial to check out this method: How To - Knitting with Two Circulars. 32" Circular needle: Hands down the most common length for knitting shawls or pieces of a sweater. It's long enough to accommodate the majority of widths for either of these projects and the cable is long enough to allow the weight of a project to rest on your lap rather than on your wrists as you work. A 32" circular is also a fabulous length to work mittens or socks using the Magic Loop method. Here's a video tutorial to check out this method: How To - Magic Loop.